I had the pleasure of directing two honors theses for two of my favorite students, Sean Watson and Tommy Rogers. Sean’s honors thesis, “On the Convergence of Infinite Series and Products”, explored the idea of infinite series in a number of different settings, including infinite dimensional spaces, Banach spaces, and Lie groups. He explored a new version of the Dvoretsky-Hanani theorem for abelian Lie groups, and also for the non-abelian Heisenberg group. Tommy’s honors thesis titled, “Super Resolution Image Construction”, combined two techniques for reconstructing a higher resolution image from a collection of lower resolution images of the same scene. This involved applying a number of areas of mathematics, including Fourier analysis, matrix theory, and group theory. 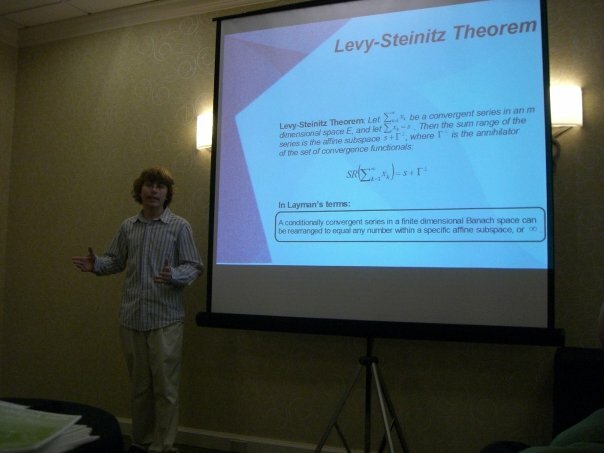 Tommy and Sean both presented their papers at the SU Research and Creative Works Symposium as well as in Portland at MathFest, the national meeting of the Mathematical Association of America. Sean received a Pi Mu Epsilon Excellent Speaker Award for his presentation.